My mom likes to tell fun stories about when my sister and I were kids. For 10 years it was just my sister C and I, and most of those years we were raised by my mom alone. Amongst the ate-an-entire-jar-of-flintstone-vitamins and snuck-raw-hotdogs stories, there is the bead-in-nose story. My sister stuck a bead so far up her nose she required a trip to the ER to fish it out. I laughed and laughed when my mom would tell this story. Surely this wouldn't happen to MY kids. MY kids would be better! Until it sorta did... and they weren't. Hammy has had nasal drainage for a while because he recently got over the head cold that's been going around. 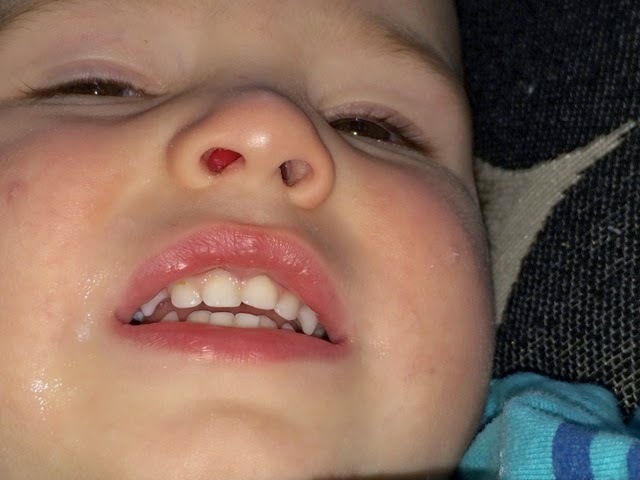 So when he asked me to get the boogs out of his nose, i didn't think anything of it. But he kept asking over and over in a short period of time, so I looked up his nose to see what was bothering him. To my surprise the inside of his nose was swollen and red. REALLY bad. I immediately called his pedi and got him seen. It looks pretty awful, doesn't it? If you're expecting me to say "the dr fished out a bead! It was just like my sister! Hahaha!" You're going to be disappointed. After checking hammy's ears and chest, he took a look up his nose and confirmed there was a swollen red lump. It wasn't a polyp or a turbinate. It was bad enough that he made an appointment at Mass eye and ear, one of the top ENT specialty locations in the nation. I was terrified! Everything I read said polyps mixed with constant respiratory infection (which Aiden and hammy get often in the winter) are a good indication of cystic fibrosis! I was freaking out pretty bad. Then, when I was changing him, I decided to take another look with a Flashlight and see all this madness for myself. 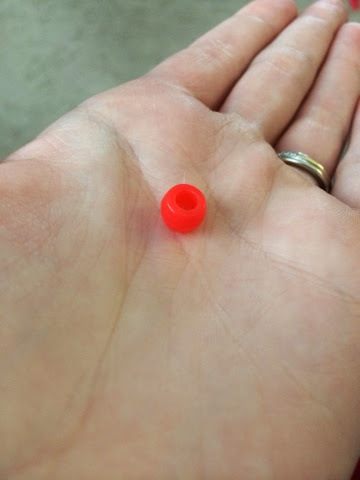 It WAS a bead. Just like my sister. Ha. Ha. Ha. Now if you'll excuse me while I chug some mylanta for this ulcer, and pop a few baby aspirin for the heart attack I just survived. Life with Hammy is never dull.